A crown fits over the existing natural tooth and replaces the natural crown, the part of the tooth which is visible in the mouth. Crowns are required to strengthen broken teeth and prevent teeth from further fracture. They are quite often used to strengthen teeth that have had root canal treatment as these teeth are more brittle and likely to fracture. They can also improve the appearance of misshapen or discoloured teeth. Crowns can be made of metal, porcelain or porcelain with metal inside for strength. The colour and shape can be matched to your own teeth. The tooth is shaped so that there is room for the artificial crown to fit over the top. 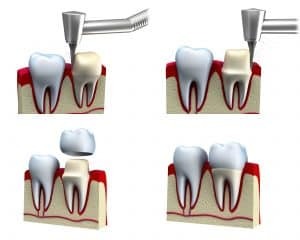 Preparation time will depend on how damaged the tooth is and whether it needs to be built up with a filling first. A soft mouldable material is used to make an exact ‘impressions’ of the tooth that is to be crowned and the nearby teeth. A dental technician uses the impressions to make the crown the exact height and size needed. A temporary crown made of plastic is glued to the tooth until the permanent crown is made. You can chew on a temporary crown but it won’t be as strong as the finished one. When the crown is ready, the temporary one is removed and the permanent one put it its place.